Klein & Wilson has recovered over $200 million in plaintiffs' cases and has won defense verdicts in "bet the company" cases. The firm's trial track record speaks for itself. The firm's attorneys have won over 90% of the cases they have taken to trial. It is common for Klein & Wilson to receive telephone calls from the parties they defeat, asking Klein & Wilson to represent them in future matters. Klein & Wilson is the firm of choice for sophisticated purchasers of legal services who want trial-tested experience for complex business litigation and legal malpractice disputes. Klein & Wilson's attorneys have extensive experience in business and commercial litigation, including contract disputes, partnership disputes, shareholder disputes, and LLC disputes; legal malpractice; real estate litigation, including lease disputes, real property disputes, and landlord-tenant disputes; and intellectual property disputes, including unfair competition and trade secrets, trademark infringement, and copyright infringement. Large firms provide substantial manpower to staff cases and have overhead to match their size. This overhead results in higher costs to clients without better outcomes. The net result is that large firms often "over-lawyer" cases, at unnecessary expense to clients. At large firms, senior partners often pass important work off to junior partners who pass it off to younger, less-experienced associates. Some big firms assign as many as 15 timekeepers to a simple case. Klein & Wilson routinely sees opposing counsel send as many as three attorneys to court on routine matters, resulting in triple billing to the client. Overstaffing increases clients' legal fees and prevents a single attorney from having a comprehensive grasp of the case. 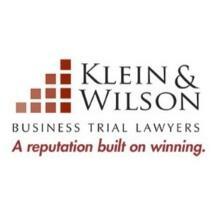 What makes Klein & Wilson so unique is its combination of trial experience and business acumen. Our trial experience and results speak for themselves. Klein & Wilson is a business. When you hire Klein & Wilson, you talk to its owners. We regularly consult with CPAs, economists, valuation experts, and appraisers. We speak your language. Klein & Wilson has battled some of the finest law firms in the nation and achieved stunning results. In addition to the firm's litigation success, the firm continues to place a premium on client service. Klein & Wilson's clients receive highly personalized service from a firm that understands the importance of courtesy and professionalism. Our clients are the reason we are in business. Klein & Wilson also assists clients in shareholder disputes, contract disputes, and other commercial litigation matters. Klein & Wilson's attorneys are experts in the use of cutting edge technology during discovery and at trial. Klein & Wilson routinely makes trials more interesting by using multimedia, including computerized document and video retrieval, videotaped depositions, and animation. Klein & Wilson has such a prominent reputation in the area of modern trial tactics, that many of the largest law firms in the country, as well as the Los Angeles District Attorney's office, the Ventura County District Attorney's office, the Kern County District Attorney's office, and leading trial organizations, asked Klein & Wilson to present seminars on how to use technology at trial. Technology is an important component of Klein & Wilson's trial success. Litigation is expensive, clients should explore settlement early and imaginatively. Unfortunately, many litigants explore settlement only after expensive discovery has been completed, and the trial date is rapidly approaching. Often, the amount of legal fees clients incur by the time of trial is so high, settlement becomes difficult. Klein & Wilson recognizes the best time to settle a case is at the outset, before clients incur substantial legal fees. Klein & Wilson spends time at the beginning of the case formulating a careful litigation strategy, also known as Litigation Analysis Memorandum (LAM), that expedites settlement, if possible. If the case cannot be settled, this strategy serves as a road map to prepare the case for trial at the lowest possible cost. For a detailed discussion of Klein & Wilson's LAM, click here. Most "litigators" are not trial veterans and take vast amounts of expensive and unnecessary discovery while overlooking crucial evidence. As a matter of course, Klein & Wilson spends substantial time with the client at the outset of the case to make sure only appropriate discovery is completed. Throughout the litigation process, Klein & Wilson keeps clients informed of the case status, seeking authority for each substantial expenditure. Because of this communication, clients can make informed decisions regarding strategy and settlement. While Klein & Wilson cannot guarantee success, the firm can guarantee its clients receive effective and affordable representation. And if your case goes to trial, you can feel confident about Klein & Wilson's experience in the courtroom. Klein & Wilson's partners are seasoned trial lawyers, not "litigators." Our competitors know we try cases, and this often helps our clients achieve favorable settlements. To speak with a trial lawyer at Klein & Wilson call 949-478-0521, or contact the firm by email. I highly recommend attorney Mark Wilson. He and his firm successfully represented me in a complex breach of contract lawsuit. In doing so, Mr. Wilson was ultra-professional, empathetic, analytical and detail-oriented every step of the way. Throughout the nearly two-year process of our initial consultation all the way through a two-week jury trial, Mr. Wilson kept me constantly informed of my options and available strategies. If you're looking for the pinnacle of legal knowledge, ethics and integrity, along with superior trial preparation and courtroom presentation skills, Mr. Wilson and his firm should be at the top of your consideration list.